As a university graduate, I was looking for a program that offered me a more hands on approach to learning with one on one attention if needed and a comfortable, positive atmosphere! The staff are kind, caring and enthusiastic about what they do which translates into the education they provide! I definitely found the type of teaching style I was looking for!! Due to that and hard work, I had a full time job lined up before I graduated! Lisa has such an incredible passion for her school that she, along with the help of her staff, has created a warm, encouraging atmosphere for her students! I’m extremely proud to be a part of the Elevate Beauty family! I researched a lot of the schools around the Nova Scotia area. When typing in google, “best esthetics in NS” this was the one that came up! I live in the HRM area and there are schools closer to me here, but as I furthered my research into this school, I discovered making the journey was worth it to get the best of the best education to make myself the best that I can be. Once I came down and spoke with the owner, it was confirmed that this was where I wanted to attend. The classes are small which gives much more one on one attention, therefore having much more practice and help with perfecting my career. 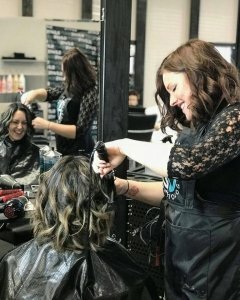 I decided to choose Elevate Beauty Institute of Cosmetology because I felt like the staff actually cared when I came to meet them and see the school, they made me feel right at home and kept encouraging me to ask questions if I had any. I felt supported and comfortable within the first 10 minutes vs my last attempt at going to school to better myself and my daughter. I can see myself learning quite a lot and being encouraged to which makes all the difference for me. I was told by a former student that this is the best institute of cosmetology in Nova Scotia. From my visit there can tell that it is a great place to learn since the classes are small and the instructors are very involved in all the work that is done. It is a very friendly environment.